B 17F 42-5370 crashed in the North Sea 4/3-1943. The aircraft belonged to USAAF 91 BG, 324 BS and was coded DF-K.
T/O 11:37 Bassingbourn. OP: Marshalling yards, Hamm. The aircraft was attacked by German fighters west of the island of Texel and crashed into the sea killing all but one crew member. Flt. Engineer T/Sgt Randle Nettles survived to become a POW. 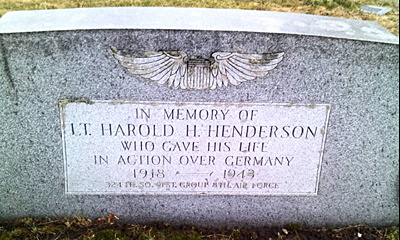 The body of Pilot 1st Lt Harold H. Henderson was found washed ashore on the island of Borkum and now rest in Riverside Cemetery, Sharpsville, Mercer County, Pennsylvania, USA. Co-Pilot 2nd Lt Leslie B. Zubiri was found washed ashore near Blåvand on Skallingen on 27/6. He was laid to rest in Fovrfelt cemetery in Esbjerg on 29/6-1943. On 30 April 1948 Zubiri was disinterred and moved to the Ardennes American Cemetery in Neupre, Belgium. Navigator 2nd Lt James S. La Rock was found washed ashore on Ameland, Holland and buried on Ameland cemetery Plot D row 13 grave 12 as " an english airman Larock" . On 21/1-1948 his remains were brought to Ardennes American Cemetery in Neupre, Belgium where he rests today. Bombardier 1st Lt William J.B. Simpson was found near at Seksbierum, Friesland, Holland on 15/8-1943 and was laid to rest at Pietersbieuren cemetery Grave 1 row 27 on 16/8-1943. Today he rest in Bankston, Alabama, USA. Radio operator T/Sgt Edward Corrigan was found washed ashore on the island of Sylt and today rests in Ardennes American Cemetery in Neupre, Belgium. Ball gunner Sgt Hymen Philips has no known grave and is commemorated on Tablets of the Missing at Netherlands American Cemetery, Margraten, Holland. Waist gunner Sgt John F. Howorusz and Waist gunner S/Sgt James D. Burton has no known graves and is commemorated on Tablets of the Missing at Netherlands American Cemetery, Margraten, Holland. The remains of Tail gunner S/Sgt Donald L. Marx was recovered from the sea between Den Helder and Texel, Holland on 10/4-1944, and was on 11/4-1944 laid to rest in Den Helder cemetery grave 218. Today he rest in Netherlands American Cemetery, Margraten Holland. On June 3. 1943 the body of a flyer was found washed ashore at the 22 km poole on the island of Texel near the village of De Koog. It is believed to have been found by German troops as the area was closed to civilians. The body was taken to the Texel cemetery Den Burg where it was laid to rest in grave 58 on the same day. In the cemetery register was recorded: AM AAF L4037299 T 42 Burten J.D. Off. On November 19. 1946 the remains was taken to Strassbourg (Probably US cemetery Lorraine) by an American Grave Recovery Team. Here it must have been buried as unknown as there is no trace of this flyer in the American registers.